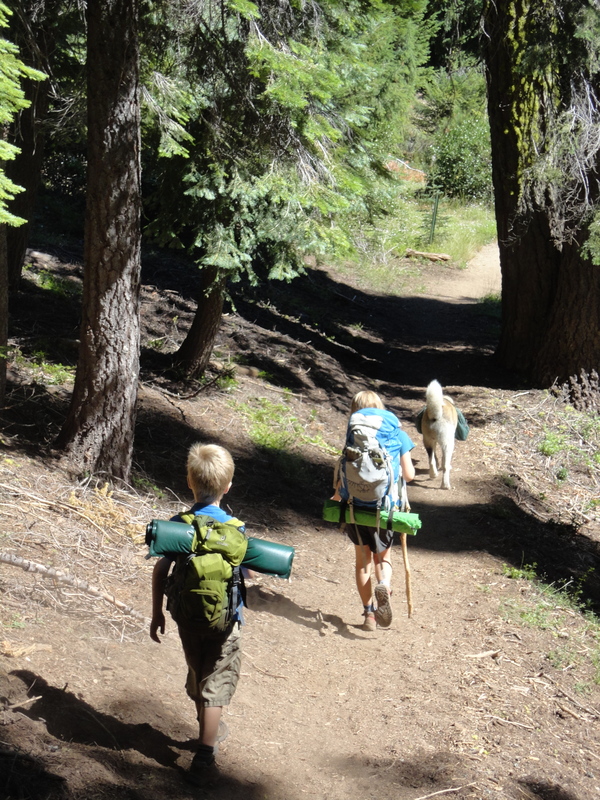 Last weekend, I took my seven-year-old son on his first backpacking trip. For my ten-year-old daughter, it was her fourth trip into the wilderness. Why do I take my children on these overnight adventures when we already live in a place more wild and natural than designated wilderness areas? The minimalist experience and little bit of suffering endured along the trail has made my children better people and me a better mother. Backpacking is not just about physical endurance, there is a psychological factor as well. Feeling the strain of the heavy back as you ascend upward towards your final destination, which in our case is a high alpine lake, overcoming the feelings that you can’t make it, only taking the essentials, the communal nature of shared meals and equipment….all of these factors create an experience that can’t be beat by any amusement park! My son was so excited for his first backpacking trip, as he has been left behind multiple times. He relished in the experience of carrying his own pack, ate food that he would not normally eat at home, and had a smile on his face pretty much the whole time (except when he fell in the lake). He’s ready to tackle more miles with his positive attitude. The last time I visited a zoo, almost every family seemed in conflict. The same occurred when seeing families back-to-school shopping recently. Although conflict can occur backpacking, the physical aspect usually works through the tears and emotions stored in our muscles, and adrenalin replaces negativity. It is hard to harbor bad feelings and thoughts when surrounded by the beauty and awe of the wilderness. If you have never been backpacking yourself or taken your children, I highly recommend it! Great inspiration about backpacking with kids! I think lots are parents are hesitant to try backpacking with their families, but you give some wonderful thoughts about the benefits! I featured your post at the Living Montessori Now Facebook page at http://www.facebook.com/LivingMontessoriNow. I actually am pretty excited to go backpacking with my kids. They are still quite young (1 & 4) so I’d like to wait a teeny tiny bit longer so I get to enjoy the trip as much as they do. We have however done quite a bit of hiking with the girls over the past few years. We just load up a frame backpack carrier and go. I even did a short 2-3km hike a few weeks after my first daughters birth (c-section).